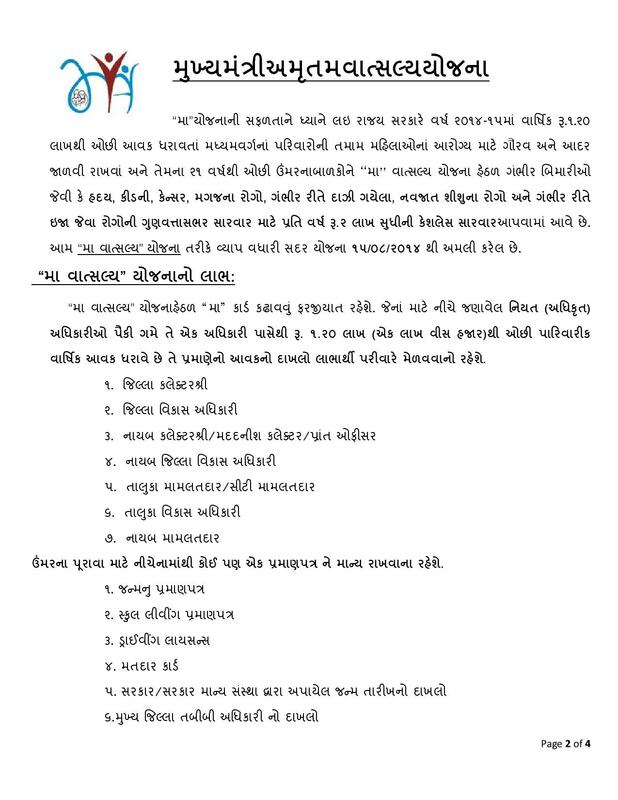 Mukhyamantri Amrutam Vatsalya Yojana, MA Yojana, www.magujarat.com: Gujarat Government announced Mukhyamantri Amrutum Valsalya Yojana for For people who are living below poverty line & lower income group, an illness not only represents a permanent threat to their income and earning capacity, but in many cases it results in the family falling into a trap of debt. 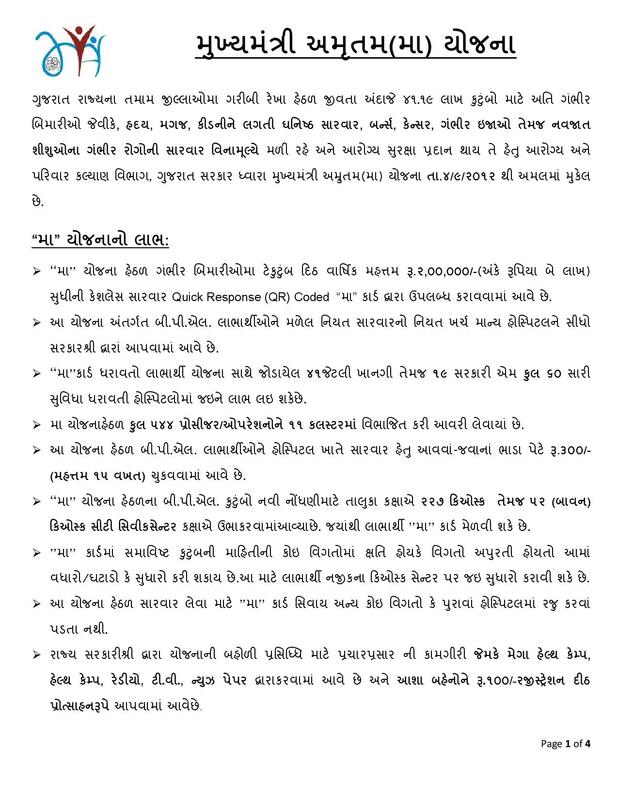 All citizen may check and download all information regarding at magujarat.com- MA Vatsalya Yojana on this page below. Mukhyamantri Amrutam “MA” & “MA Vatsalya” Yojana provides tertiary care treatment to Below Poverty Line (BPL) population &to the families having an annual income Rs. 1.50 lakh or below Rs.1.50 lakh per annum. All beneficiaries can avail cashless quality medical and surgical treatment for catastrophic illnesses related to: (1) Cardiovascular diseases, (2) Renal (Kidney) diseases, (3) Neurological diseases, (4) Burns, (5) Poly-Trauma, (6) Cancer (Malignancies), and (7) Neo-natal (newborn) diseases which covers 628 defined procedures along with their follow ups. The Sum assured is up to Rs.2,00,000/- per family per annum on a family floater basis. Rs. 300/- is paid to the beneficiary as transportation charges for every instance of availing treatment from the empanelled hospital. contains the photograph of the head of the family/spouse, a unique registration number (URN), District name, Taluka name & Village name and the biometric thumb impressions of all the enrolled family members along with the details are stored on the central server which can be fetched online at the click of a button. 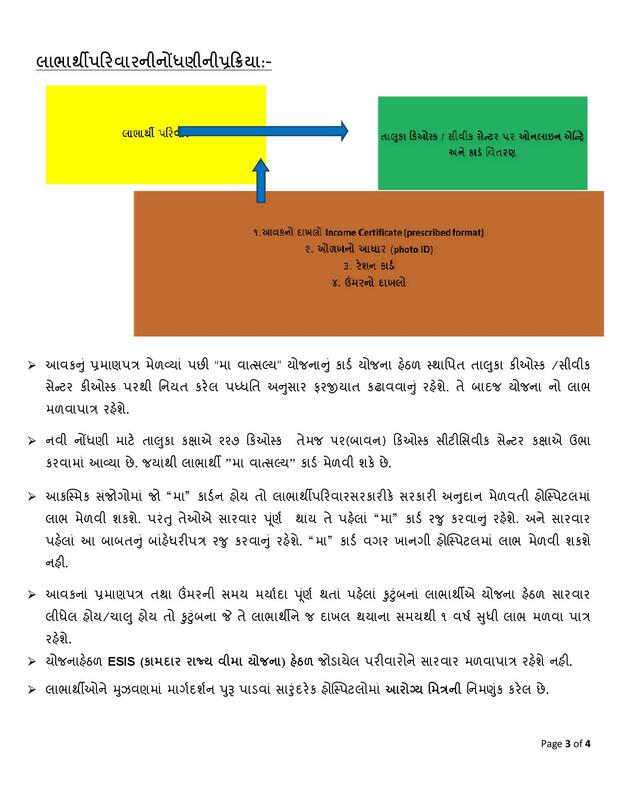 “MA Vatsalya” Card is compulsory for availing treatment. “MA Vatsalya” Card and for that the following officers have been appointed to give income certificate to the beneficiaries. There are zero direct costs incurre by the beneficiaries of MA Yojana as all costs of treatment, medicines, follow-up and transportation etc are borne by the State. Payment against approve claims is release directly through RTGS. by the State Government. No intermediary agency is involve in the process. This is a 100 % State funded scheme where the fund directly goes to the service providers. An Implementation Support Agency has been appoint for claim processing and appointment of Regional Coordinator, District Coordinator & Arogya Mitra. Package rates selected under ‘MA’ are derive from the market through competitive bidding process via e-tendering. Unlike from other states which went by the recommendation by Advisory Committee members in this Scheme. Mukhyamantri Amrutam Yojana has been award by the prestigious SKOCH Awards for Smart Governance 2014 on 20th September, 2014. Mukhyamantri Amrutam (MA) Yojana has been award by the prestigious CSINihilent e-Governance Awards 2013-14 on 13th December, 2014. Mukhyamantri Amrutam (MA) Yojana has been award for Best Affordable Healthcare Initiative in Healthcare summit 2016 at Jaipur.